Dr. Bronner is exceedingly ‘big picture' as a business. It makes personal care products – and very, very good personal care products at that. However, the brand is so much more than that. The products it makes are the result of a much bigger world view. This focuses on the truth that every decision and action we take is part of an inescapable interconnection with the entire world. From their suppliers, to employees, to customers – all these people who are part of our world – Dr Bronner as a company make decisions that profoundly affect all of their lives and the environment in which they live. This leads us to Dr Bronner's extensive Fair Trade policies, Organic integrity policies, transparency as a company, benefits and profit-sharing with employees, animal welfare advocacy, Truth in Labelling activism. Take all of this together, and you have Dr. Bronner. All that it is as a company intersects in soap that they sell, but to say that they are just a soap company leaves a lot out. WHAT DOES IT MEAN TO ‘GO GREEN'? Green is a colour of life. To ‘go green' means to live in such a way that promotes vitality and vibrancy in the many spheres of our lives. Going green means making life-sustaining and life-improving choices for our bodies, our homes, and our world. The founder's grand-daughter, Lisa Bronner, can sustain her entire personal care routine with the Dr. Bronner Pure Castile Liquid Soap and coconut oil. 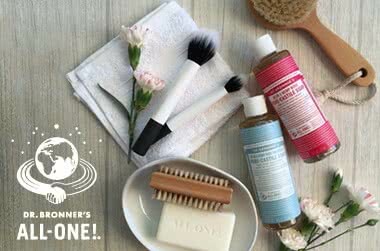 The Dr Bronner Pure Castile Soaps are gentle yet effective to wash her from head to toe. They resolved her adult-onset acne situations and got her off the hamster-wheel of conventional shampoo. They keep her skin balanced. "It is refreshing as well to have been able to take the zillion bottles of various washes out of my shower, and replace them all with just the one bottle of Dr. Bronner. Secondly, coconut oil is the most amazing product and I really don't know how I lived so long without it. I'm still reeling from my discovery of it, and it's been two years since it entered my life. I use it to shave, remove make-up, moisturise from head to toe, as a hair masque, in my home made deodorant and sugar scrub, as a nail nourisher. I could go on. You'll just have to try it."